May(/should) escooters be ridden on sidewalks? May(/should) escooters be ridden in the street? May(/should) escooters be ridden in a bike lane? What, if any, are age restrictions? Although they have been around for years; the have recently become explosively popular and far more common in places where so-called dockless sharing has been made available. In particular Tempe (and probably neighboring Scottsdale?) where at least three companies have put hundreds of the devices onto the city’s streets; Bird, Lime, and Razor. Tempe is a small-ish land-locked city bordering Phoenix that’s dominated by Arizona State University. For before/up to 2019, see below. A bill has been introduced into the 54th1Reg session (spring 2019) that would clarify and classify most operational aspects of escooters in state law; only if passed, of course! It then simply tacks on these new devices to the existing ebike statute(28-819, from last year); in other words EMS and ESS, like ebikes, would also be “granted all the rights and privileges and is subject to all of the duties of a person riding a bicycle.”; explicit relieved of any licensing, registration, title, administrivia. Aside from that some of the definitional stuff doesn’t seem clear, e.g. “IS POWERED BY AN ELECTRIC MOTOR OR HUMAN POWER, OR BOTH.” would seem to say a scooter without an electric motor is still defined as an ESM or ESS; is that what was intended? The speed clause seems a bit fuzzy; are the speeds mentioned (20 and 10mph) meant to be design capabilities, or operational? If the former it would seem there’s no way to know what speed a motor+human power could produce. First hearing on bill was 2/13/2019. Video is available at the bill’s link above; the heavy hitters were there (both bird and Lime); nothing was mentioned about the “unique identification” that seems problematic to me. It flew through committee… curiously Cities of Chandler and Peoria registered as against but didn’t speak. Prime sponsor is Tyler Pace (R-Mesa). The devices seem to have no relevant definition in the ARS. They cannot be a bicycle, if for no other reason that the wheel-size requirement excludes them; this also rules out the possibility that they can be any other derivative form of bicycle, such as moped or motorized bicycle, or the new e-bike definition. Other possibilities are Motorcycle, but lack of a seat rules that out. The do fit the definition of a motorized skateboard, but that only states that such devices are not motor vehicles; and there are no other references in ARS to them. 38. "Motorcycle" means a motor vehicle that has a seat or saddle for the use of the rider and that is designed to travel on not more than three wheels in contact with the ground but excludes a tractor and a moped. 39. "Motor driven cycle" means a motorcycle, including every motor scooter, with a motor that produces not more than five horsepower. (i) "Motorized skateboard" means a self-propelled device that has a motor, a deck on which a person may ride and at least two tandem wheels in contact with the ground. (ii) "Motorized wheelchair" means a self-propelled wheelchair that is used by a person for mobility. One might wonder, if not for wheel-size thing, might they fit the definition of an e-bike? No, because buried in the e-bike definition is “equipped with fully operable pedals”. They might, then still be a motorized bicycle or moped because neither of those have a pedal requirement (these categories are all rather inconsistent) — but that’s just a hypothetical; their wheels are like 8″ or something, far below the 16″ minimum. One might also wonder that maybe these are actually simply motor vehicles; but within the definition of MV it excludes something called a motorized skateboard, which would fit (two tandem wheels and a deck). It’s also possible the legal parsing of “self-propelled” would exclude it; is the kicking required, meaning it’s not self-propelled? Lacking any applicable regulation, next stop would be to look for local ordinances. Ug; that’s nearly impossible to do thoroughly, there are at least dozens of sets of local ordinances, that of course depend on knowing exactly where you are (are you in Phoenix, Tempe, Scottsdale, Chandler, Gilbert or Mesa? These cities and towns all have unique codes, and I might ride a bike in three or four of these in the same day on a regular basis). One thing about state statute is clear, Bicycle lanes are for the “exclusive use” of bicycles (28-815C), so unless otherwise stated in a local ordinance any/all of other gadgets may not use a bike lane. Notably, one documented case of DUI, along with hit-and-run (and other) charges have been filed by city of Tempe against an escooter rider regarding an incident that occurred October 28. 2018 “Shelton Begay, 28, was seen riding in lanes of traffic on Rural Road near Broadway Road when he was involved in a collision with a southbound vehicle in another lane”. The cases show up on the city court’s site (but not supreme court case search). Given the ambiguous status of escooters in ARS, it’s not completely clear how those charges should apply. More about the ever-popular topic of BUI on a bicycle see here. Recently DUI-attorney Cantor (whose position regarding bicycle-DUI I’ve disagree with) was quoted in a news article raising doubt about the charge, saying he’s filing a “friend of the court” brief which I think is the right thing to do, maybe we’ll get some actual clarification on the issue. Since Tempe is a hotbed, it’s certainly a logical place to start. Motorized play vehicle means a coaster, scooter, any other alternatively fueled device or other motorized vehicle that is self-propelled by a motor or engine and which is not otherwise defined in Arizona Revised Statutes, Title 28, as a "motor vehicle," "motor-driven cycle" or "motorized wheelchair." Sec. 19-22. - Prohibited operation. One legal hair splitting with this def’n might be what does self-propelled mean? Does “kicking” to get the thing going mean that it’s not self-propelled? — if so then this def’n can’t apply. Bicycle: A device propelled by human power which any person may ride, having two (2) tandem wheels or having three (3) wheels in contact with the ground. Electric bicycle: A two- or three-wheeled vehicle with fully operable pedals and an electric motor of no more than 750 watts (1 h.p. ), the maximum speed of which on a paved level surface, when powered solely by such a motor, is 20 mph. Light motorized vehicle : All gas or electric powered, two- or three-wheeled vehicles with a gross weight of less than one hundred twenty (120) pounds and a maximum speed of thirty-five (35) miles per hour that are not an electric bicycle or an electric personal assistance mobility device. So it (still) can’t be an e-bike in Tempe even though there’s no wheel-size restriction, because the e-bike def’n in Tempe, like the state, requires fully operable pedals. There is, however, another odd (according to my way of thinking) category, the light motorized vehicle (LMV), that seems to fit escooters. This is a relatively unrestricted designation, LMVs are more-or-less treated like bicycles under this designation, since an LMV rider “is granted all of the rights and is subject to all of the duties applicable to a bicycle rider under state and local law”. They may be ridden on any roadway open to bicycles regardless of posted speed limits or number of lanes (which is every road in Tempe. Only fully-controlled limited access highways prohibit bicycles), if there is a bike lane they may ride in it. Sidewalk use is permitted, but limited to human power only (how would that be enforced? ); Helmets are required but only for persons below 18 (and i think the minimum age is 16, i need to look up). See Chapter 7, Article VI for the full list. Note that the LMV def’n does NOT say anything about “self-propelled”. There is an urban legend floating around; this was repeated to me 2nd hand as coming from Tempe police officer: scooters are only allowed on streets (perhaps streets posted above a certain mph?) with bike lanes or somesuch. Other variations of this same theme are that escooters are only allowed on sidewalks along streets with no bike lanes. This seems to be wholly untrue; as noted above there is the play-vehicle restriction to 25mph streets but that says nothing about bike lanes. Motorized play vehicle means a coaster, scooter, any other alternatively fueled device, or other motorized vehicle that is self-propelled by a motor or engine, gas or electric, and which is not otherwise defined in Title 28, Arizona Revised Statutes, as a motor vehicle, motorcycle, motor-driven cycle, motorized wheelchair or electric personal assistive mobility device. Motorized skateboard means a self-propelled device that has a motor, gas or electric, a deck on which a person may ride and at least two tandem wheels in contact with the ground and which is not otherwise defined in Title 28, Arizona Revised Statutes, as a motor vehicle, motorcycle, motor-driven cycle, motorized wheelchair or electric personal assistive mobility device. 36-64 Motorized skateboard and motorized play vehicle; prohibitions; disclosure requirements. The rules in Phoenix governing motorized skateboards and “play vehicles” are rather draconian. The only reasons i can think of that these rules wouldn’t apply are the self-propelled question; and the “not otherwise defined” possibility… though I don’t think either of those pan out. There are four, and only four, “Person Types” that can be involved in a traffic crash per the ACR (Arizona crash report form; a standardized form used throughout Arizona). eScooterists would then have to be… Drivers. This would somewhat consistent with the current taxonomy of defining riders of motorized bicycles as drivers, also. Thanks for the research and posting this article. E-bikes suffered for a long time (and still do to a certain extent) from a lot of misinformation held by the public and lawmakers, and laws were passed in Arizona with out the benefit of sound knowledge behind those laws. Only recently have some of the challenges uninformed legislation pose for e-bikes started to be reversed. Too bad, because I like seeing e-bikes available as a transportation option for those of us living in urban areas. Similarly, a lot of concern has sprung up around e-scooters. I am generally more pro-regulation than the next person and I don’t mind seeing e-scooters coming under some legal scrutiny – but with hopefully more thought than what occurred with e-bikes early on. I don’t have an e-scooter and do not plan to get one. Even so, I see them as a great solution compared to the automobile. The single largest safety threat to us cyclists is the automobile. I think everyone can agree that collision with an automobile while on a bicycle will likely result in serious injury or worse. Therefore, I believe anything that promotes non-auto-oriented transportation is good for cyclists. And e-scooters could be just the tip of the iceberg when it comes to new types of personal transporation we will encounter in the near future. Based on recent news and weather reports, Arizona is seeing more and more days with air pollution alerts each year, with significant consequences to public health. The automobile (that is with an internal combustion engine) plays a significant role in degradation of Arizona’s air quality. E-bikes and e-scooters have no emissions, and even the electricity used to charge them can be produced emission free. Many of the objections I’ve heard about e-scooters have to do with how station-less e-scooters were brought into the urban landscape by companies looking to profit from their use. Some people have felt that the station-less e-scooters, and station-less bike share for that matter, have caused blight in many downtown areas. In some cases, the companies bringing scooters and bike share were only trolling for personal data that could be garnered when users signed up for and use their phone apps. Apparently, that user data can be sold, producing more revenue than the e-scooter rental. Bottom line, I hope Arizona carefully regulates e-scooter use, but in an informed manner that recognizes the benefits e-scooters will provide to cyclists and the public at large. I’ll throw another wrench in the works by announcing that I’ve just bought an electric skateboard. I’ll be riding it around Phoenix in the same fashion as I do my bike, so it’ll be interested to see how law enforcement react. In my experience the average Phoenix PD officer has very little knowledge of the specific laws governing bicycles, so it think it’ll be a total crapshoot with an electric skateboard! Also, could “Motorized play vehicle” be any more demeaning? There is much to be made right when it comes to the regulating of slow moving vehicles. Accepting them by the drivers of cars should be the first thing to deal with. There being no uniform acceptance as to whether or not they are to be on the streets or the sidewalks makes it very unsafe and unpleasant to travel by these means. I have been riding motor assisted bicycles sense 1988. My experience has been colorful and twice almost death dealing. Most officers seeing me ride do not hinder me. There are some that seek to stop my riding by this means and will do underhanded things in their attempts. Unfortunate but true. I ride using all the laws applicable to motor vehicles with one exception, which is to ride to the far right as is safe to ride in an effort to stay out of drivers way. When I am riding major streets I ride in the gaps between the groups of cars that occur due to traffic lights. I pull off the road when a surge of cars comes up behind me so as to keep living. I stick to side streets whenever I can and will travel at speeds of up to 25 MPH whenever I feel it is safe and no officers are around. I do not believe it to be safe to travel any faster than that because I want to live and I don’t want to hurt or kill anything I might unavoidably hit due to the many things that could happen. I hit a dog while traveling about 21 MPH and it was not anything nice for me or the dog. Any faster and I believe things could have been life threatening. I ride and give everything I encounter the right of way because I want to live and I feel it is better for all involved. I ride through all the mentioned cities in the article and figure in the bad cop citations and confiscating of bikes a part of the operation costs of this type of travel. I want to do my part to stop killing the earth and this is the price. My most fear that I will be killed by a driver that is not alert and hits me from behind. I believe that a mirror, speedometer, front and rear lights are a must and a loud horn is wise as well. I do not ride using a helmet as I feel that hearing whats around me is very important and has saved my life more than once. I have been hit by cars 3 times, the last time being the worst event. While traveling at about 4 miles an hour along side stopped cars that were backed up from the stop light a driver became impatient and gunned their car making a hard right to get out of the back up, hitting me square in my hip as I was right at the front right corner of their car when they made this move. $366.000.00 dollars and a month and a half in the hospital later I came home to a long form ticket for riding with a 49 1\2cc motor on my bike (legal limit is 48cc) Long form ticket is a ticket given a person that is not there for one reason or another that can be pursued by the court for up to one year from the issuance by the officer. I was never called in to court over this ticket. The driver was not issued any ticket by the officer. I ride as if everything is out to get me and everything can come out of everywhere instantly. My life depends on it. I could be dead right in many circumstances but I would still be dead so I push no right of way issues and give in to any aggressive behavior by automobiles. I can put a dent in a car, a car can kill me dead…. Steven Goodridge said in a facebook postWhen considering regulations for electric scooters, there are some fundamental principles of vehicle traffic regulation to keep in mind. 1. The primary purpose of vehicle regulation is to protect the safety of other, innocent users of the shared road system, with the balanced objective of preserving the freedom of all travelers to reach their destinations. 2. The greater the potential of a vehicle to injure others, e.g. due to speed and/or mass, the stronger the regulation that may be warranted. 3. There is no minimum speed capability or minimum mass requirement for vehicle use on normal roadways. Only fully controlled access highways, which do not directly serve destinations, and which are redundant to other roads in NC, are prohibited to bicycles and mopeds. Farm tractors, bicycles, horse-drawn carriages, and other slow vehicles are permitted to operate on ordinary rural roadways and city streets, and their drivers all follow the same basic rules of movement to avoid collisions, which includes being prepared to slow or stop for slower traffic ahead at all times. 4. Because pedestrians are more vulnerable than are users of motor vehicles, and because pedestrians do not expect motorized traffic in pedestrian spaces, motorized vehicles are generally prohibited from pedestrian spaces such as sidewalks. Devices such as motorized wheelchairs that are designed to assist people with a disability impairment to move slowly within confined pedestrian spaces and which do not present a safety hazard to other pedestrians are a necessary exception to this. Roadways, not sidewalks, are designed to accommodate the kinematic and dynamic maneuvering characteristics of normal wheeled vehicles from bicycles to trucks. 5. If a particular vehicle class has specific equipment or registration requirements under state law for operation on public ways, those requirements apply to operation ANYWHERE within the public right of way, not just on the roadway portion. A vehicle that cannot be legally operated on the roadway due to unsafe/insufficient equipment or lack of registration may not be operated on the shoulder or sidewalk where it would present an even greater public hazard. 6. Low-speed vehicles are an ever-present part of the traffic mixture on ordinary (non-freeway) roads. If interactions between low-speed and higher-speed traffic on a particular ordinary road is deemed unreasonably unsafe, unpleasant, or inconvenient, the prudent remedy is to change the road in ways to reduce conflicts and/or speeds, and not to prohibit users of lower speed vehicles from accessing the destinations served by that roadway. Allowing electric scooters to be operated on roadways according to the movement rules for vehicles, and according to the equipment requirements for mopeds, would seem consistent with these principles and with existing state law. (Scooter equipment may need to be upgraded with a bar-end mirror and a better rear lamp, however, and some registration procedure may be needed.) Operators who violate the movement rules for vehicles may be ticketed. 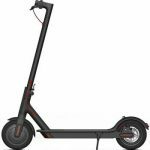 A case may also be made to treat electric scooters more like electric bicycles given their light weight, and as such there may be some pedestrian spaces where operation of electric scooters and electric-assisted bicycles is acceptable. In contrast, to ban 15-mph-electric scooters from roadways while allowing them to be driven among pedestrians on sidewalks, which some communities (such as Charlotte, NC) have done, is to turn the principles of vehicle traffic regulation upside-down.